Doos in twee delen in witte porselein met een gekwast overglazuur decor in rood met wat groen en goud (Imari kleuren), de binnenzijde met een eenvoudig handgeschilderd decor. De doos sluit op een ingenieuze manier. Dit stuk is door de eerste eigenaar aangekocht bij Galerie Carla Koch te Amsterdam in 2001. Akaji Ken is born in Kanazawa, Japan in 1938. At the age of 16, Akaji Ken started as an apprentice with a master who taught him the distinctive overglazing technique. When he was 27 he opened his own workshop where he produced artwork in the Japanese tradition. 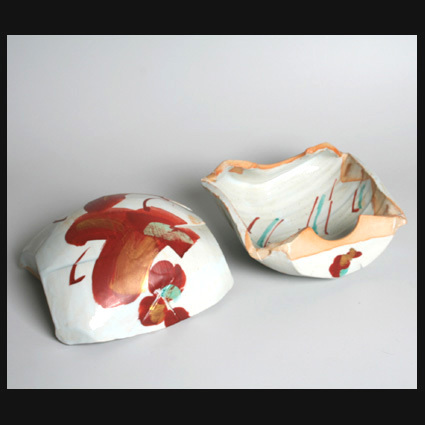 Still, he was looking for new possibilities in ceramics and took part in the crafts movement, which championed a modern approach towards ceramics. 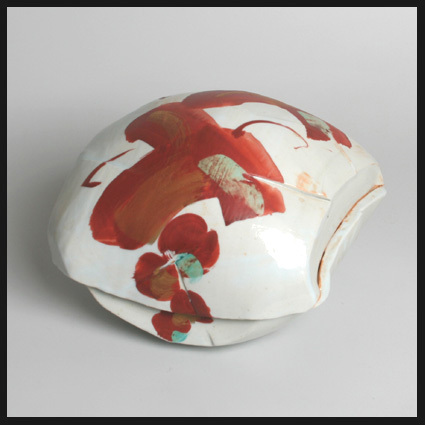 Since 1981 Akaji has been focusing on red overglazed works, on which the red decoration is applied through simple brush strokes. Even though the work of Akaji Ken is clearly influenced by Japanese tradition, he has developed a completely unique and distinctive style. 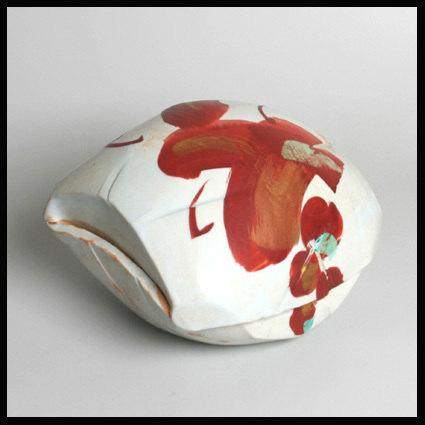 Akaji Ken has become known through his red overglazed objects and his subtle and consistently applied impressionistic decorations. 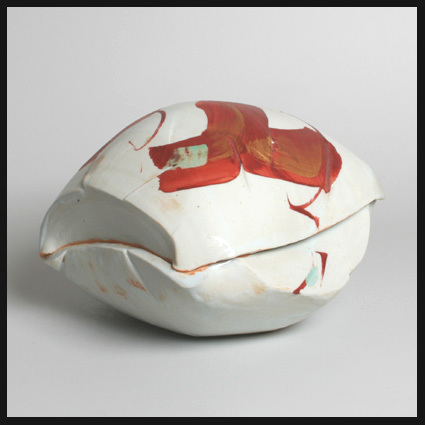 He first creates an object with a smooth white glaze. 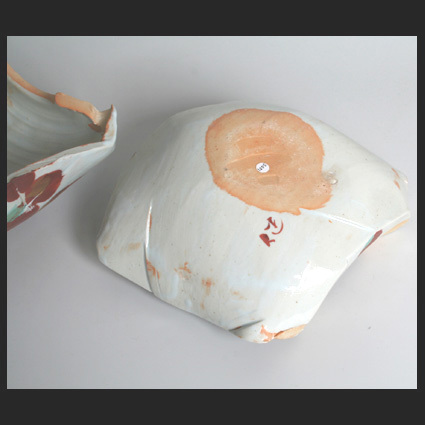 After this has been heated, he adds another, coarser, coloured layer on top of the glaze and once more the object is heated. 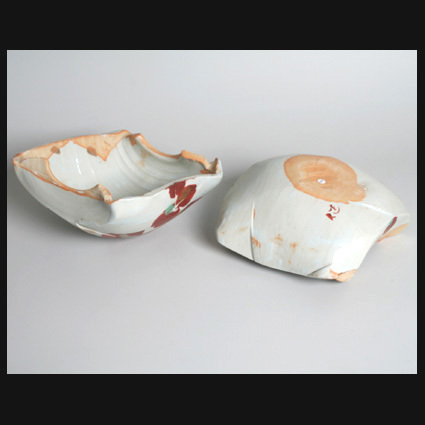 Akaji's shapes stem directly from Japanese tradition. He produces sake cups, stackable boxes and sushi dishes, whose shapes hardly differ from every-day Japanese utensils. However, through his decoration techniques these objects transcend their daily functions, even though they can still be used. At the exhibition in 2001 at Carla Koch Gallery in Amsterdam Akaji Ken displayed monumental objects. At the exposition in 2003 he once more displays a series of boxes at the same gallery. 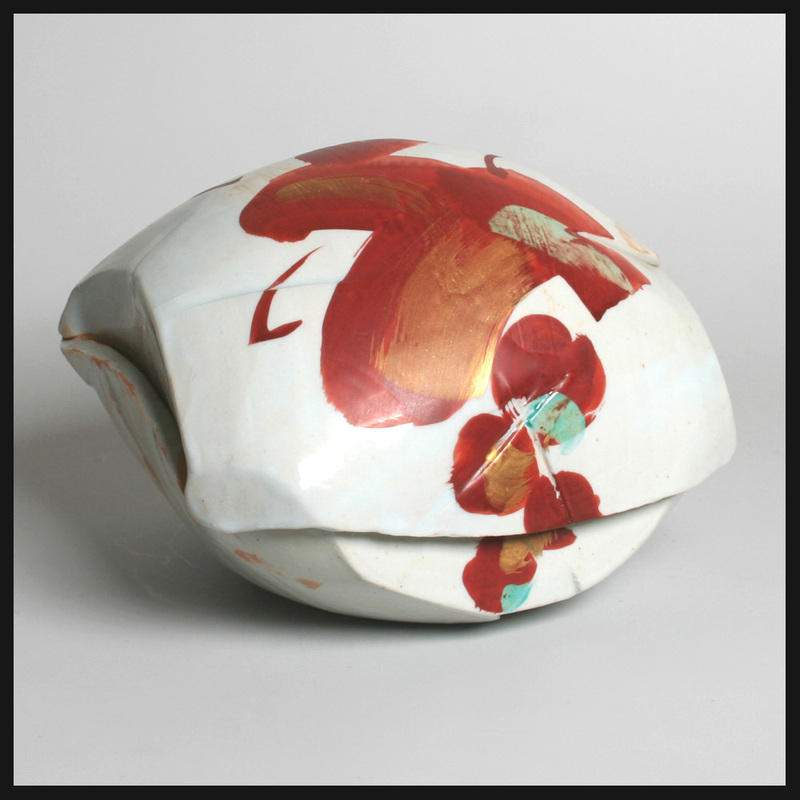 Akaji Ken proves himself as one of the masters of contemporary Japanese ceramics, which is obviously rooted in the overwhelming Japanese tradition. Text and portrait courtesy: website Carla Koch, Amsterdam, about 2003.